Eric Carlson, “Eric Carlson,” Histories of the National Mall, accessed April 22, 2019, http://mallhistory.org/items/show/434. World War I US Army veteran Eric Carlson joined the 1932 Bonus March to seek early payment of pension money promised veterans by the government. He was shot during a confrontation between marchers and DC police, who were trying to evict the marchers from their campsites. Another marcher, William Hushka was also shot and died instantly; Carlson died from his wounds within a week of being shot, on the same day that Hushka was buried with military honors at Arlington National Cemetery. Carlson was also buried at Arlington. 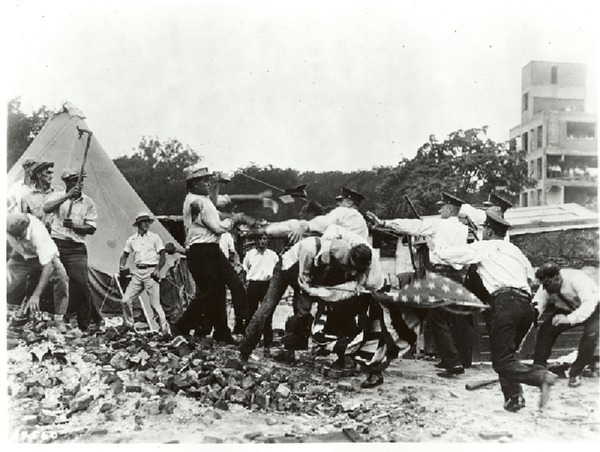 The Bonus March was a protest and occupation of the National Mall by World War I veterans who were demanding pensions. Lack of work because of the Great Depression made the need for pensions particularly pressing. Nearly 43,000 participated in the protest. Some camped on the Mall or nearby, while others occupied government-owned buildings near the Mall. On July 28, 1932, Attorney General William D. Mitchell ordered the veterans be removed from the Mall and their other camps. Resistance to police pressure led to an outbreak of violence. Many were injured, but Carlson was mortally wounded and William Hushka was killed. When police action proved insufficient to remove the protesters, Army Chief of Staff Douglas MacArthur brought soldiers onto the Mall, supported by six tanks, to remove the remaining demonstrators and burn their shelters and belongings.